the heart of the craftsman. as the master wields the hammer. The lands stretching from the western slopes of Kri'staK to the waters of Lursor have been the home of the House of Toragh since the formation of the Empire. At the foot of Kri'stak lies the *Heart of Kri'stak* - the Forge of the House of Toragh. The sons of Toragh have supplied Klingon warriors with the finest blades in the Empire - 'etlhmey vaQqu' - for over 1500 years. These are but a few examples. 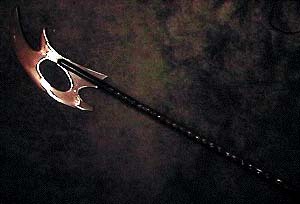 The qutluch is the traditonal weapon of the Klingon assassin. Since honorable assassination is performed with very traditional weapons, it is not unusual to find the use of a family heirloom for the task. This particular weapon is a quarter inch thick with an eight inch long blade and has a hardened animal skin handle with a bone guard and pommel. The standard betleH is a result of the evolution of the original sword of Kahless to a form more condusive to combat in tight spaces ie. onboard starships. Although swords of this size will vary from warrior to warrior due to the individual's size and fighting style, the average dimensions are 39 inches from primary blade tip to primary blade tip and 15 to 16 inches from the spine of the sword to the end of the main blades. This piece is in quarter inch titanium and is 40 inches across. The blade is polished to a 300 grit and is left with a matte silver finish typical of these weapons. The handles are leather strips wrapped over contoured hardwood spacers. 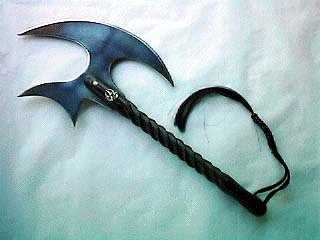 The 'alngegh is one of two types of battle-axes used by the Klingon warrior (the other being the jey'naS or double headed axe - Okrand's "Klingon for the Galactic Traveler".). 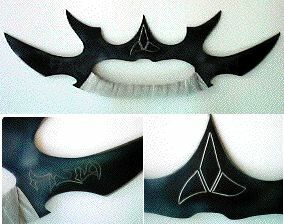 These weapons are ancient in origin and reflect the design elements that are common to Klingon edged weapons today. This axe is 16 inches in length and 11 inches from the leading edge of the blade to the tip of the secondary spike. It is made of quarter inch titanium and rests in a hardened wooden handle that is 20 inches in length. The spiral pattern in the handle is characteristic of House of Toragh construction and improves the grip when holding the shaft. The bottom picture shows the weapon after lanyard and the Symbol of the Imperial Weapons Guild have been added to the DeS. 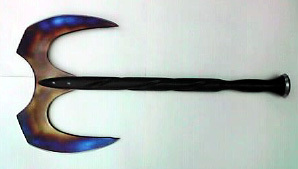 This is the second of the Klingon battle axes - the Double Headed Axe. The material is quarter inch titanium and the dimensions are 15.5 inches in width and 12 inches in height . The 28 inch handle of the jey'naS is slightly longer than that of the 'alngegh to allow for added balance needed with the heavier blade. In addition, there is a pommel of 3/8th inch titanium joined to the handle with a quarter inch thick threaded steel rod and blended with several layers of Terran Water Buffalo Horn. 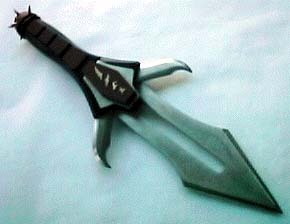 The Daqtagh is the preferred personal knife of the Klingon warrior. It is compact and quite deadly in the hands of the trained Klingon. Over the years several variations of the knife have been seen - smaller primary blade with complex fore-guard area and spring operated secondary blades that act as guards, a larger bladed version with simpler fore-guard and spring operated secondary blades and a version similar to the second type in all respects except the secondary blades are *fixed* in the open position and do not retract. The bottom picture shows the knife fully assembled with the moQ (spherical pommel) and the DuQwI'Hommey (little spikes) installed, along with the symbols of the House of ownership. The knife is 16 inches overall in length with a 9 inch primary blade. The primary blade is 3.25 inches at its widest and the secondary blades are 3 inches long and 1 inch wide. All blade parts are a quarter inch in thickness and the handle is a polymer material that matches the fore-guard in all respects except for it's color. This particular model is not spring operated, but lever operated in order to satisfy certain state and federal laws concerning *spring operated knives*. The QIS is first seen in Star Trek *Generations* in the hand of the ever treacherous B'Etor. It is a simple but elegant blade. The graceful curves and saw-teeth become deadly in a trained warrior's hand. Okrand refers to a QIS as a *wavy bladed* knife. I can only assume he is referring to the gentle *S* curve as opposed to a straight blade or single curve of the scimitar. This knife is made of quarter inch titanium with stainless hardware. The handle is made of leather washers hardened in lacquer and polished to a satin finish. The tajtIq is referred to by Okrand as "a knife with a particularly long blade that is used almost as if it were a sword." The weapon pictured has a 20 inch long blade with one large barb and several saw teeth gracing it's spine. It is 2.5 inches wide and made of quarter inch thick 440C stainless steel. This picture shows a close up of the handle and guard. You can see the comfortable coils that the animal horn provide on the grip and the outer edge of the sterling silver pommel. These weapons are designed after the blade Worf used in his *duel* with Gowron in the Hall of Warriors in *Apocalypse Rising*. As you can see these share the characteristics of the previous tajtiQ - most notably the *swordlike* quality in a smaller *package*. Reference: Worf in ST DS9 Episode *Apocalypse Rising* and Okrand's *Klingon for the Galactic Traveler*. 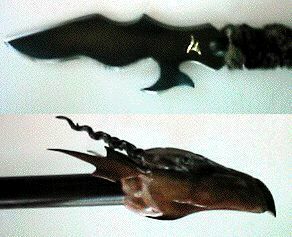 The yan is the most ancient of Klingon swords. Before Kahless received the vision of the bat'leth, the yan was the preferred sword of the Klingon warrior. This weapon is made of 3/16 inch titanium and is 39 total inches long. 32 inches of blade and 7 inches of handle (hidden tang). The large *belly* on the mid blade gives the sword an overall width of almost 6 inches. The handle is a combination of a micarta *form* wrapped in soft leather with a pommel of animal horn. The guard is 3/16th inch titanium contoured with a perimeter of *spikes*. In Okrand's *Klingon for the Galactic Traveler he describes the ghonDoq as a very slender knife. The example shown here is seen in the hands of a Klingon sent to kill Jean Luc Picard in *Sins of the Father*. It is 16 inches in overal length with the blade measuring 9.5 inches. The last 5 inches of the blade is comprised of a slender taper that starts at one inch in thickness and gradually tapers to the piercing point. 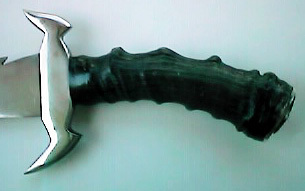 Several individuals have discussed the existence of a Klingon throwing knife. Although there is no direct reference to one, there is a small knife carried by both Kurn in *Sons of Mogh* and by Gowron in the *Klingon CD ROM*. The important aspect of this knife is that in the Klingon CD ROM Gowron actually throws it at you. I think thats documentation enough. This knife is made of D2 tool steel that is 3/8th of an inch thick. This gives it the strength in the spine that throwers need to stay in one piece. It also has a simple handle construction to allow for easy release when used. The guard and pommel are both brass. The guard is stock brass bar and the pommel is cast with the emblem of the House of Toragh on it. This the ma'veq, a ceremonial knife used in the ritual of *Mauk To'Vor*. The original blade was a quarter inch thick but I thought that a thicker blade would show more depth so this one is made from 3/8th inch titanium. It is polished to a 400 grit and heated to an almost bronze tone. The two cut-outs along the centerline accent the spine made by the hollow grinding of the primary bevels. The total knife is 15.5 inches long from blade tip to pommel. The handle is 5.5 inches and the pommel and screw are 2.5 inches leaving a blade of 7 inches long. The handle itself is carved synthetic and the *hardware* is custom cast brass. Special thanks to Dr. Lawrence Schoen and Dr. Marc Okrand for deriving the proper spelling of this traditional Klingon blade. Hopefully the future will bring more weapons to this site. This is not a commercial site. I make weapons for my close warrior friends and because I have a deep love for the process, but I do not have enough years left before I go to the Black Fleet to spend *churning* out weapons. The Guild has been opened to provide information, advice and instruction. Perhaps I can set you on the correct course to obtain the knowledge you seek. For all of you with the Warrior's Spirit...........Walk with honor ! !